Having a pile of knitting WIPs that won’t finish themselves I still offered to help a friend with finishing her latest knitting project. She has been unwell and her granddaughter is growing fast. The dress seven eighths completed needs to be finished so she doesn’t grow past fitting into it. My crafting mojo has been flagging, even for my own projects. I wasted a lot of time yesterday thinking I should get on with it then when I finally started picking up stitches at the neckline it bamboozled me and I am not happy with the result. Bah!! I think my expertise (I use the term very loosely!) is on holiday. Currently working on picking up stitches at the armhole and hoping that will be easier/look better. Cute self patterning yarn so at least it’ll be pretty – and there may be a few added ‘extras’ in the end, such as tiny daisies along the neckline to enhance it (to cover the wonky finishing! ), approved by my friend of course, not just randomly added by me. Anyone else having the odd few fails with their crafting this year yet? 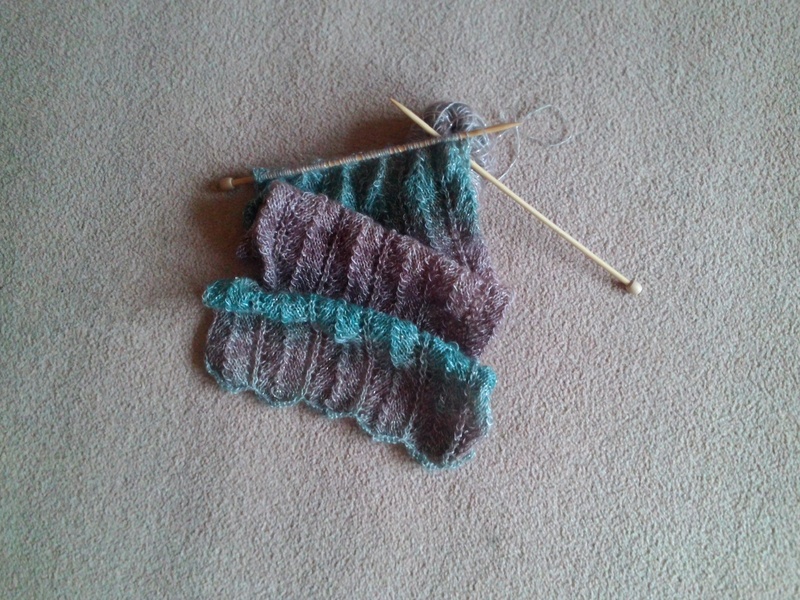 I have also been passed on two knitting projects to complete from my mother in law – one done, the other pending. Both baby jackets, both kind of time dependent. A new baby in the family due soon, but these were started for her cousin two years ago. The first baby grew past the size knitted. My mother in law is unable to knit now due to ill health. Sadly, I think this will involve much ripping and even reknitting and I am querying the use of the yarn itself, as it has what looks like a ‘tea stain’ on part of the half knitted jacket. Oh, what do I get involved in sometimes? Hints on how to remove old tea stains required. Anyone? One day I shall have no WIPs – said most knitters, never. I say this because I am dying to start something new. January yarn sales are crying out to be taken advantage of and I am trying to resist. This entry was posted in Uncategorized and tagged knit.